Spring Montessori Unit for children aged 2-6. Changes in nature present plenty of opportunities for explorations and learning. This pack will provide your students with hours of Spring themed engaging activities that will assist them in developing fine motor skills, number recognition, reading, logical thinking. Hands-on activities, three part- cards, student booklets, adventure hunt, lacing cards, counting cards, and more! 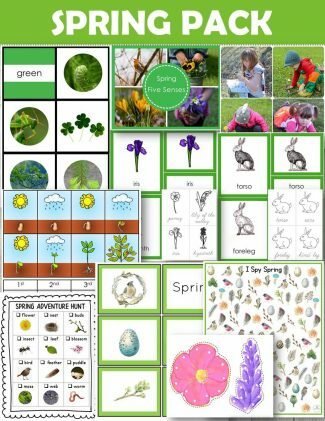 Four Colors of Spring (red, blue, yellow, and green) – sorting hands-on activity featuring clear photographs and images (five per color) that represent the gorgeous palette of nature in spring. Encourage children to conduct conversations based on their personal experience and observations. 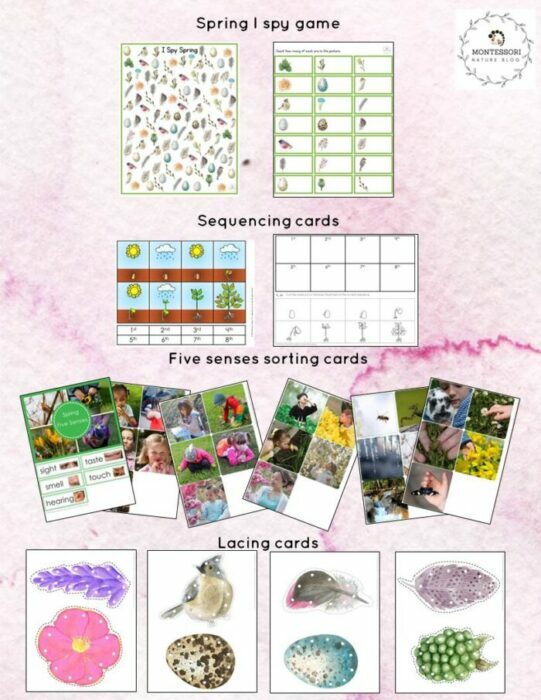 Five Senses and self-assessment sheet – sorting hands-on activity – features five beautiful photographs for each of the five senses. 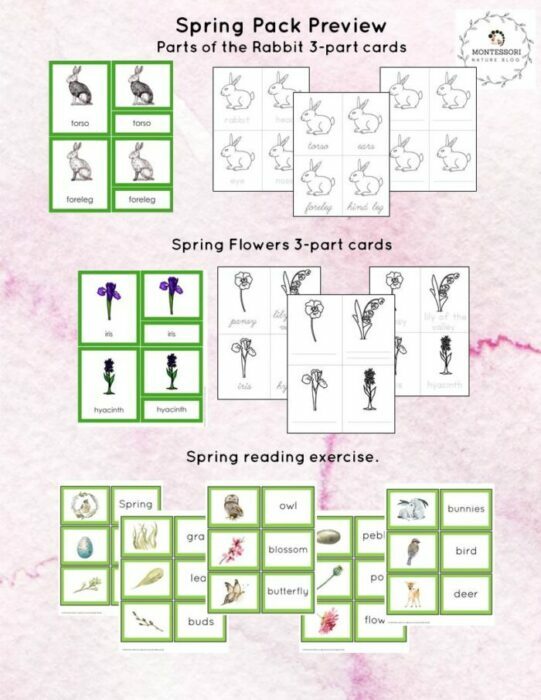 12 Spring Flowers Three Part Cards and Student Booklet with cursive, print for tracing and blank for independent writing. Flowers presented: bluebell, crocus, daffodil, hyacinth, iris, lily of the valley, pansy, pleione formanosa, snakehead fritillary, snowdrop, tulip, winter aconite. Features clipart. Parts of the Rabbit Three-Part Cards and Student Booklet with cursive, print for tracing and blank for independent writing. Part of the body included: torso, hind leg, foreleg, eye, nose, whiskers, feet, head, ears, tail. Features clipart. 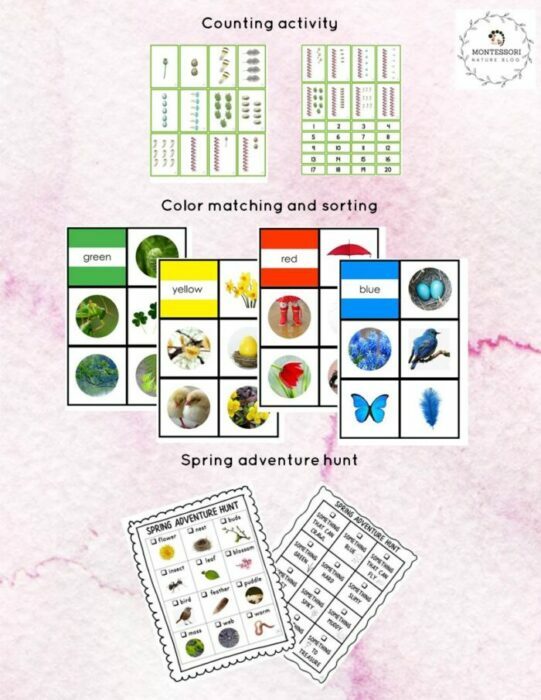 Spring Adventure Hunt – 2 printables with a list of treasures to be found on a nature walk. Spring Reading Cards for reading and matching. 18 pairs. Plant Sequencing Cards and student worksheet.